Scientists from Louisiana State University (LSU) are using neutrons at Oak Ridge National Laboratory (ORNL) to study the effects of employing an alternating electromagnetic field to produce low-temperature catalytic reactions by heating iron oxide nanoparticles with hydrocarbon molecules attached to the nanoparticle surface. The researchers used a radio frequency (RF) generator to stimulate the nanoparticles, transferring the generated heat to the individual hydrocarbon molecules and restructuring their chemical bonds to produce value-added products. "We want to significantly reduce energy consumption and increase catalytic reaction efficiencies by isolating heat generation to the location of the molecule, instead of heating entire reactors to extremely high temperatures," said James Dorman, professor for the Department of Chemical Engineering at LSU. "Lowering overall process temperatures during catalysis also reduces the formation of coke and unwanted by-products, such as greenhouse gas emissions." The team exposed its samples to an RF field in a laboratory chamber, immersed them afterward in liquid nitrogen to freeze everything in place, and then observed the results using neutron-based vibrational spectroscopy at the VISION beamline located at ORNL's Spallation Neutron Source. Neutron scattering combined with vibrational spectroscopy is an ideal method to study energy transfer across inorganic-organic interfaces. LSU researchers are currently developing advanced methods of synthesizing iron oxide nanoparticles and modifying their shape to control a sample's surface sites involved in adsorption and surface reactions. Various particle morphologies, including spheres, cubes, and hexagons, can be produced to optimize their use in different catalytic applications. 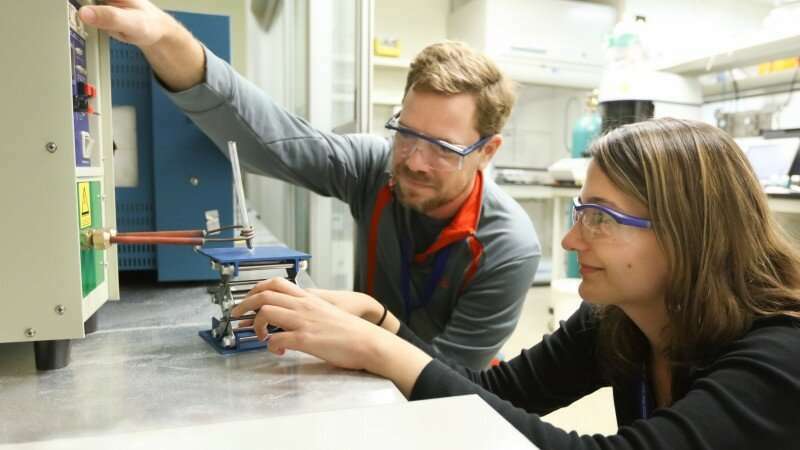 "One of our biggest challenges is to control the process of synthesizing nanoparticles and optimizing their morphology at the same time," said Natalia da Silva Moura, a graduate student in Dorman's group at LSU. "The neutron data enables us to see how each shape interacts with our target molecules and then improve the design to maximize the efficiency of the localized heating and reactions." Part of the experiment includes pulsing the RF field to limit the reaction and prevent the formation of coke on the surface. Of particular interest is the amount of energy transfer caused during heating as a function of the magnetic field's frequency and strength. Once this relationship is understood, the scientists plan to develop new catalysts to drive reactions down alternative pathways that increase selectivity and yield without the need to apply high temperatures, which will help meet a US Department of Energy (DOE) goal for increased energy efficiency in US industry.